FEB172612 - A Diamond Select Release! The Phoenix rises! The popular Marvel Gallery line of PVC dioramas continues with ..
MAR172722 - A Diamond Select Toys Release! 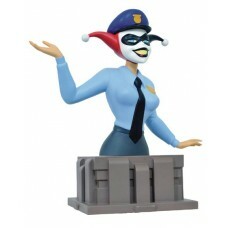 It's been 25 years since the world was introduced to Harley Quinn, and DST is..
JAN172654 - A Diamond Select Toys Release! You've met the Mad Hatter, now meet him again! This 7-inch, Previews-exclusiv..
JAN172651 - A Diamond Select Toys Release! Batman can defeat any foe, but can he stand up to the power of reading? Booki..
DEC162560 - A Diamond Select Toys Release! This tiger has changed its stripes! Like many of Batman's classic foes from t..
JAN172650 - A Diamond Select Toys Release! Now this is a statue worth stealing! Continuing DST's Premier Collection line..
JAN172652 - A Diamond Select Toys Release! The Joker makes a triumphant return to the DC Gallery line! Based on the famo..
FEB172601 - A Diamond Select Toys Release! Batgirl is back in black! This black-costumed rendition of Batgirl is based o..
FEB172600 - A Diamond Select Toys release! Riddle me this, riddle me that - who's the Bat-foe with the most stylish hat?.. DEC162558 - A Diamond Select Toys release! Is it hot? No, it's ice cold! DST has upgraded their bestselling electronic 1..
FEB172621 - A Diamond Select Release! Formerly an Internet exclusive! It's time to go back... back to the future! DST ha..
FEB172602 - A Diamond Select Toys release! Great Scott! Marty McFly and Doc Brown have just jumped forward in time, and ..
FEB172603 - A Diamond Select Toys release! Great Scott! Marty McFly and Doc Brown have just jumped forward in time, and ..
FEB172607 - A Diamond Select Toys release! Fore! Get ready for another round of Caddyshack Vinimates, based on the class..
FEB172606 - A Diamond Select Toys release! Fore! Get ready for another round of Caddyshack Vinimates, based on the class..
FEB172604 - A Diamond Select Toys release! May your days be long upon the Earth, and may you have plenty of Vinimates! A..
FEB172605 - A Diamond Select Toys release! May your days be long upon the Earth, and may you have plenty of Vinimates! A..
DEC162561 - A Diamond Select Toys Release! We've never been more excited for a black cat to cross our path! This black-c..
JAN172655 - A Diamond Select Toys Release! From the distant world of Altair IV comes Robby the Robot, the most technolog..
DEC162557 - A Diamond Select Toys Release! Just when you thought it was safe to go back to Gotham! The critically acclai..
DEC162559 - A Diamond Select Toys Release! Liv Moore is back from the dead! Again! The iZombie action figure line return..
DEC162563 - A Diamond Select Toys Release! All hail the king of Atlantis! Based on his appearance in the classic Justice..
JAN172653 - A Diamond Select Toys Release! You don't need the wisdom of Solomon to know that this bust is a must-buy! Ba..
JAN172648 - A Diamond Select Toys Release! The Marvel Gallery line of dioramas continues with one of the Marvel Universe..
DEC162562 - A Diamond Select Toys Release! When Gwenpool takes a selfie, it's time to practice your selfie-defense! Comi..
JAN172646 - A Diamond Select Toys Release! Prepare for the coming of the Odinson! The God of Thunder heralds the return ..
DEC162568 - A Diamond Select Toys Release! Wolverine is the best he is at what he does, and his enemies aren't bad at it..
JAN172661 - A Diamond Select Toys Release! One of the most highly anticipated Spider-Man films of all time is almost upo..